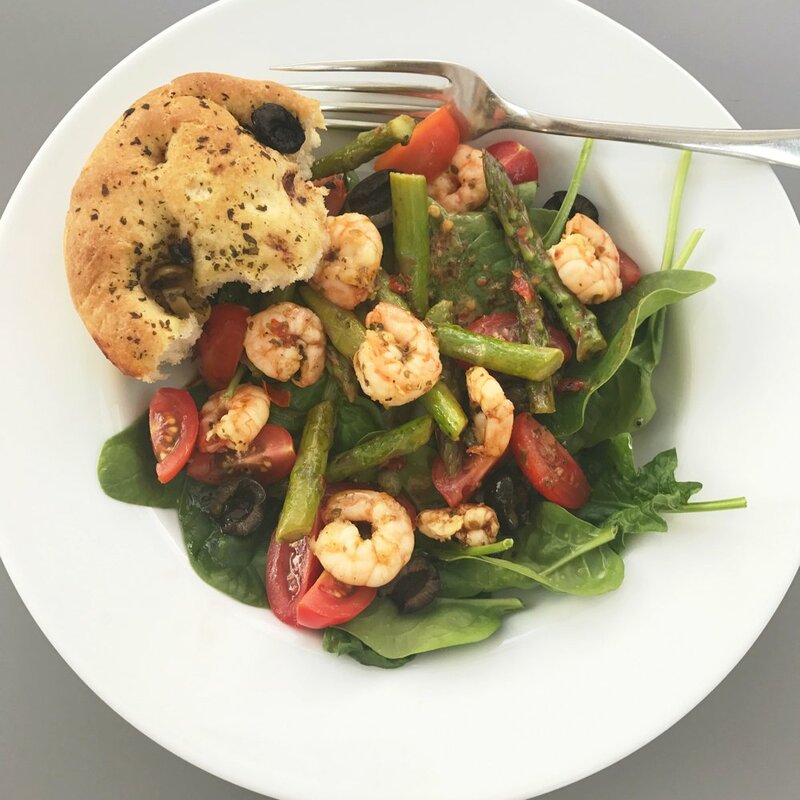 Prawn and asparagus salad is a super easy midweek meal, I won’t lie… you’ll never get the kids to eat this, but… that’s what the standby box of fish fingers is for, right? 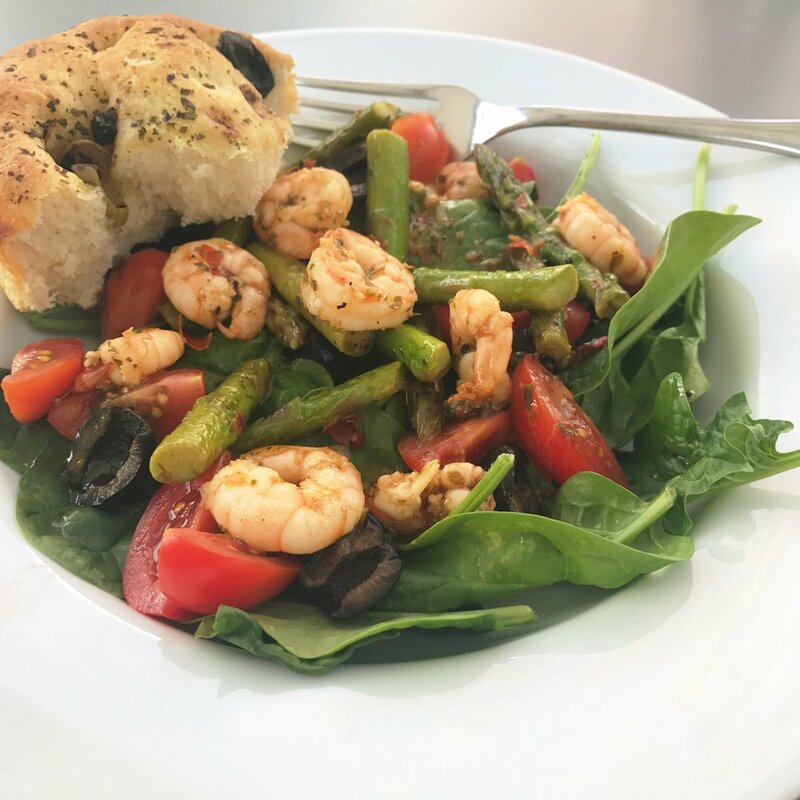 I marinate the prawns and asparagus in a lovely Italian style dressing, throwing in olive oil, Lazy Chilli, oregano, a squeeze of lemon and lots of black pepper. They only need a few minutes to soak up all the flavour. Salad wise, I cheat as usual and use baby spinach leaves or sometimes a bistro salad mix. I want dinner to be ready fast! Tip the prawns and asparagus into a bowl and tip in the olive oil, lemon juice, chilli, oregano and season with sea salt and black pepper. Toss everything together with your hands and put to one side until ready to cook. Scatter two plates with salad leaves, cherry tomatoes, olives and capers. Heat up a frying pan until it's nice and hot, then tip in the prawn and asparagus plus any juices in the bowl. Stir fry briskly over a hot heat until everything is cooked through - around 6-8 minutes or so, just check the prawns are cooked thoroughly. (Add a little more olive oil if you think it needs it). Scatter the cooked prawns and asparagus over your salads, then I like to drizzle over a little of the juices left in the pan. Don’t fancy prawn? Then switch if for salmon or chunkily sliced mushrooms. Want to go Oriental then choose the Oriental salad bag, maybe throw in some rice noodles and dress the prawns and asparagus with a sprinkle of 5-spice powder or Szechuan pepper instead of Oregano. Want it all warm – then cook the whole lot – throw the spinach and baby tomatoes into the pan with the prawns and asparagus. Delicious served with some freshly warmed focaccia bread. Add a side of cheat-y Puy Lentils, we like the microwave sachets. And.. it’s very nice with a glass of icy cold Pinot Grigio.